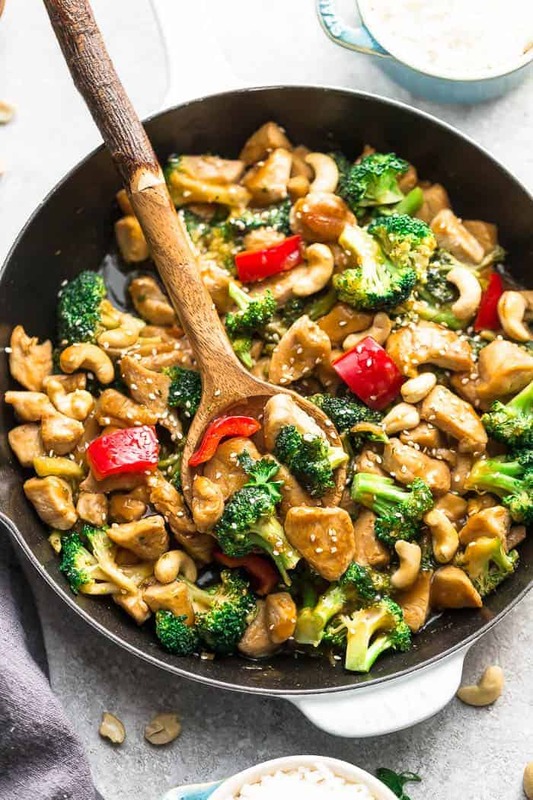 This Keto Cashew Chicken recipe is a low carb & paleo friendly meal with all the delicious flavors of a Chinese restaurant takeout dish. This healthy Whole30 one pan meal comes together in less than 30 minutes & is perfect for busy weeknights. Making low carb Chinese stir-fry dishes at home with restaurant quality are easier now that keto friendly ingredients are so accessible. You can still get those great flavors without compromising your health goals and trying to stay within your macros. And that’s what I love about Keto and Paleo eating. You can make a few small substitutions in nearly any recipe to get the same flavors and textures. 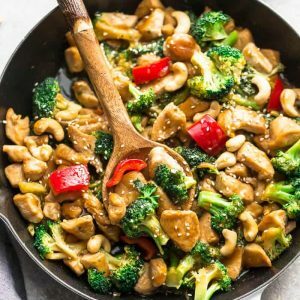 We are all about quick cooking weeknight dinners and this Keto Cashew Chicken comes together in less than 30 minutes in just one pan. If you’ve been craving the Cashew Chicken from Panda Express or PF Chang’s for takeout, this paleo friendly homemade version is full of flavor and couldn’t be easier to make. My family loves Asian inspired dishes, so we are always trying to make our own low carb / copycat version of restaurant style dinners at home. A few popular reader favorites include this Instant Pot Beef and Broccoli , Chicken and Broccoli Stir Fry and Chicken Chow Mein (not low carb). Just like with most Asian takeout dishes, the sauce is what makes any stir-fry the best. This keto friendly sauce is a combination of liquid aminos, sesame oil and five spice powder to add that umami kick. Apple cider vinegar adds the little bit of tangy-ness and the red pepper chili flakes for the kick of heat. Xanthan gum helps to thicken the sauce so it coats the chicken and veggies just like at the restaurants. 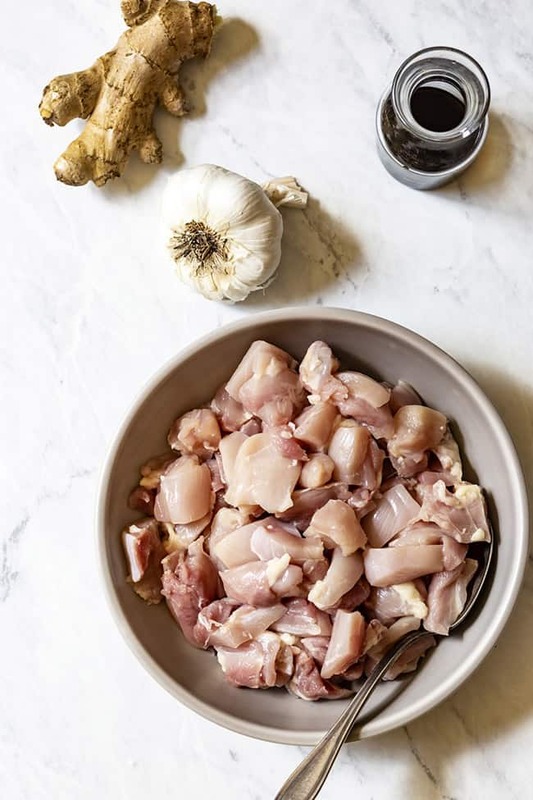 Season chicken with salt, pepper and toss chicken with baking soda. Allow to sit while you make the bowl. To make the sauce and marinade, whisk together the broth, aminos, sesame oil, vinegar, five spice powder, chili flakes. Toss chicken with 1 tablespoon of the sauce. Allow to marinate for 10 minutes. Add avocado oil to a hot wok or pan. Sear the chicken until brown then transfer to a plate. Add a little bit more avocado oil then add broccoli and bell peppers. Cook for about 2-3 minutes or until tender crisp. Stir in the remainder of the sauce. Sprinkle in xanthan gum, if you want a thicker sauce. Add the cooked chicken back to the pan until heated through. Sprinkle with toasted sesame seeds and green onions and serve over cauliflower rice or lettuce wraps. 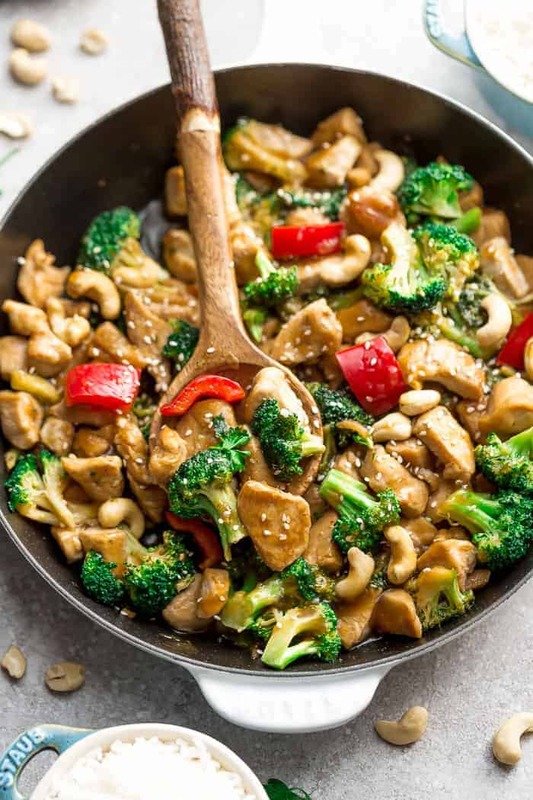 If you’re not a fan of broccoli or bell peppers, you can also make this low carb cashew chicken with zucchini, bok choy, green beans or mushrooms. 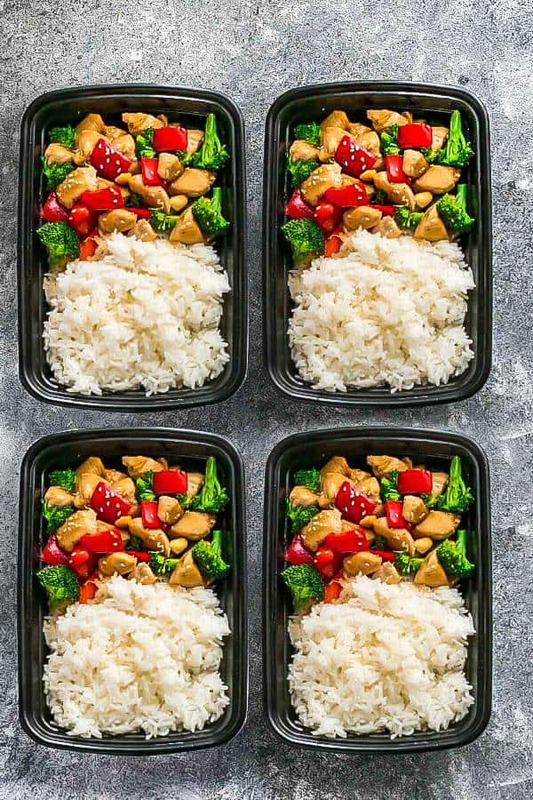 WILL KETO CASHEW CHICKEN WORK FOR MEAL PREP? 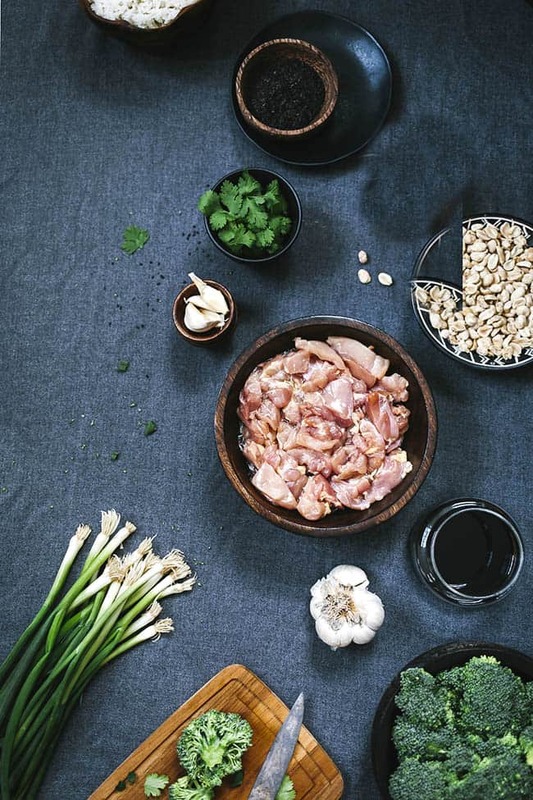 This low carb cashew chicken is perfect for making ahead on your Sunday meal prep. Simply divide into air-tight containers and store in the fridge for up to 3 days. WHAT SIDES CAN I SERVE CASHEW CHICKEN WITH? 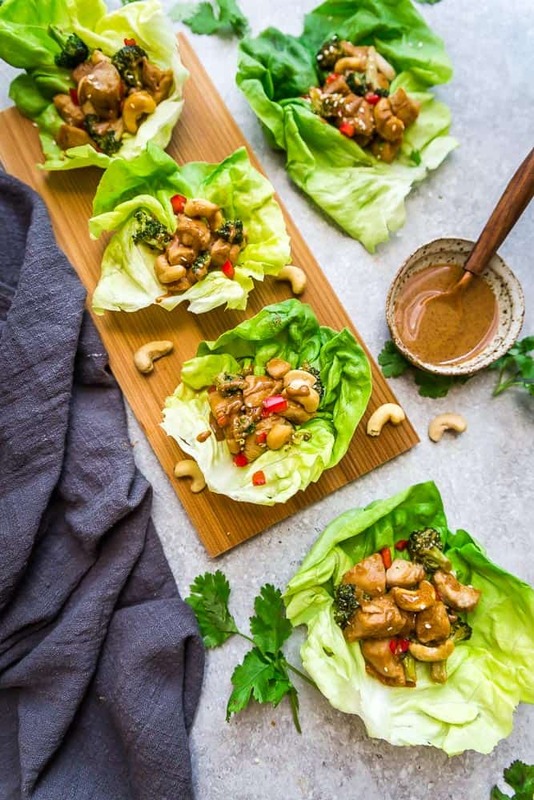 Cashew chicken is delicious on its own or you can serve it over cauliflower rice, lettuce wraps, zucchini noodles, shirataki noodles or konjac rice. The best part of having takeout cashew chicken is coating your sides with that amazing sauce. My husband lives for Asian takeout sauces so we always double the recipe whenever we make this. Keto Cashew Chicken - a low carb & paleo friendly recipe with all the delicious flavors of the Chinese restaurant takeout dish. This healthy Whole30 one pan meal comes together in less than 30 minutes & is perfect for busy weeknights. Season chicken with salt, pepper.. Allow to sit while you make the bowl. To make the sauce and marinade, whisk together the broth, aminos, sesame oil, vinegar, five spice powder, chili flakes. Toss chicken with 1/2 tablespoon of the sauce. Allow to marinate for 10 minutes. Stir in the remainder of the sauce and the cashews. Sprinkle in xanthan gum, if you want a thicker sauce. This was so yummy! I swapped out cashews for peanuts and didn’t see in the recipe where to add them, so I just added them at the end. Otherwise I followed the recipe (with the xanthan gum) and I will definitely be making this again.